­­­Welcome to the Freedom Boat Club Lake Erie – Rocky River, Ohio! Freedom Boat Club Lake Erie (FBCLE) was founded in 2009 by Beckett and Jim Spreng. Freedom Boat Club Lake Erie has four locations – Rocky River (Emerald Necklace Marina), Cleveland (Channel Park Marina), Huron (Huron Lagoons Marina) and Catawba Island (Catawba Landing Marina). As a Member of Freedom Boat Club Lake Erie you receive unlimited access to all four locations. You also enjoy free reciprocal boating privileges at more than 175 other club locations throughout North America, Canada, and Europe. Here's how it works: Your hassle free boating experience begins the moment you arrive at the dock. Our dock hands will help you get your belongings onto the boat. Then you and your crew head out for a day of boating fun. Upon your return, simply turn in your keys and pay for the fuel that you used that day. Our dock hands will help you unload your gear, and then you drive away. No worrying about boat maintenance, dock fees, insurance, depreciation, trailers or clean up. You have access to not just one boat but our entire fleet at our four locations. Feel confident and safe heading out to your favorite fishing spot or destination on our deep bowed boats. 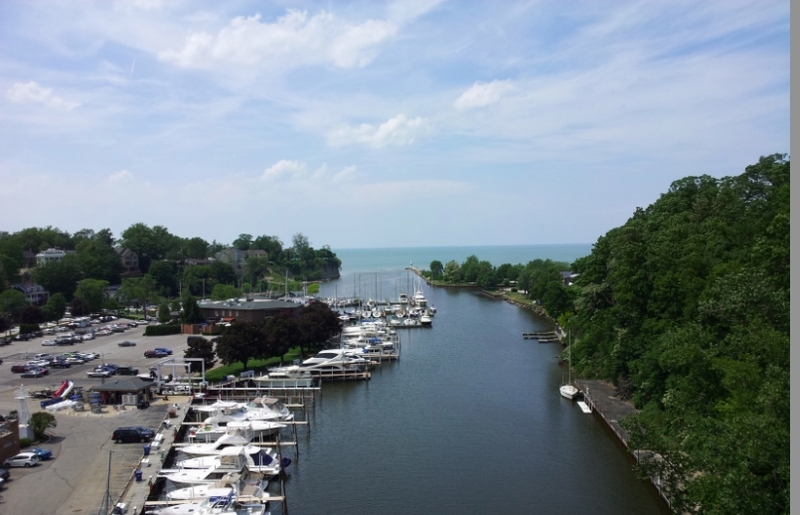 Emerald Necklace Marina: Freedom Boat Club of Lake Erie – Rocky River is located at Emerald Necklace Marina, which is the perfect location for fishermen, boaters, families and simply anyone interested in enjoying the Lake Erie waters on the Central Basin. Situated in the beautiful Cleveland Metroparks, the marina is surrounded by over 21,000 acres of parks, trails, picnic areas, golf courses and more. The marina provides amenities such as a restaurant with a beautiful patio setting, indoor seating with air-conditioning, a party room for special occasions, a gift shop, live bait, ice, restroom facilities, fuel docks, and kayaking/paddle boarding rentals. Being just 15 minutes west from downtown Cleveland, Rocky River has access to all of the treasures of the city, including the Rock and Roll Hall of Fame, award winning restaurants and big-name concerts – there's certainly something for everyone! Whether you're looking to spend a fun day on Lake Erie with your family, or trying to reel in a big catch or just wanting to watch the sunset over the beautiful Cleveland skyline, Rocky River is the perfect place for you! What a Member of Freedom Boat Club Lake Erie will enjoy: Whether taking part in water sports (waterskiing, wakeboarding, tubing), fishing, visiting the islands, or dining by boat, you will create memories that last a life time. We offer our members a full social calendar of events, including Open Houses/Member Socials, fishing clubs, safety clinics, Lady Divas, island cruises, and our annual fish fry. All of these activities allow you to enjoy and familiarize yourself with the surrounding marina and to get to know other Freedom Boat Club Lake Erie members. Our goal is to ensure that our members feel comfortable and confident at the helm. As a Freedom Boat Club Lake Erie member you are entitled to receive FREE unlimited training by our team of United States Coast Guard licensed captains. We provide personalized one on one training, including a mandatory boater training class for all new members. The class consists of a combination of classroom and on-the-water instruction. Additional and continuing safety information and training clinics will be available and running all season long. A Member of FBCLE must be 21 years of age; boaters born on or after January 1, 1982, must have a valid Ohio Safe Boating Card. FBCLE members have the opportunity to join the Laguna Yacht Club (LYC) for $250 Initiation fee, with annual dues of $200. The LYC membership includes 24-hour access to the HLM Pool Complex (May through September), fuel discounts at the HLM fuel dock, access to the Viking Den Restaurant at anytime, and affiliation to Interlake Yachting Association and Yachting Club of America, which entitles members to visit other clubs around the great lakes and country. We also like to leave a philanthropy footprint! FBCLE supports local and national non-profit organizations and invite our members to join in on the fun. Depending on the location/weather, our boating season starts mid April and runs until the end of October. We are open 7 days a week (weather permitting) to serve you and your boating needs. Boating is also available by utilizing the reciprocal membership benefits at over 175+ locations throughout North America, Canada, and Europe. Visit us on Facebook and Instagram at Freedom Boat Club Lake Erie. Freedom Boat Club - Boating Made Simple!